Holy hell—Bryan Fuller is going to bring Neil Gaiman's American Gods to television. We are freaking out. After American Gods got stuck in development hell at HBO it bounced around until finally finding a place to land today. 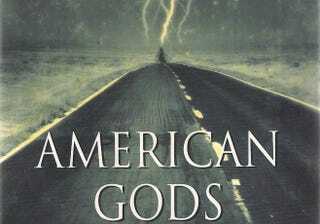 Starz just announced in a press release that not only will they be providing a home for the long-awaited TV adaptation of Neil Gaiman's urban fantasy novel American Gods, but they are getting Bryan Fuller (Pushing Daisies, Hannibal) and Michael Green (The River, Kings0 to write the pilot and co-produce the show (along with Gaiman). Yes, wow, everyone freak out. This is a very different crew than we anticipated, but we are very excited that Fuller will be around to work on the fantasy aspect of this book. "When you create something like 'American Gods,' which attracts fans and obsessives and people who tattoo quotes from it on themselves or each other, and who all, tattooed or not, just care about it deeply, it's really important to pick your team carefully: you don't want to let the fans down, or the people who care and have been casting it online since the dawn of recorded history. What I love most about the team who I trust to take it out to the world, is that they are the same kind of fanatics that 'American Gods' has attracted since the start. I haven't actually checked Bryan Fuller or Michael Green for quote tattoos, but I would not be surprised if they have them. The people at Fremantle are the kinds of people who have copies of 'American Gods' in the bottom of their backpacks after going around the world, and who press them on their friends. And the team at Starz have been quite certain that they wanted to give Shadow, Wednesday and Laura a home since they first heard that the book was out there.I can't wait to see what they do to bring the story to the widest possible audience able to cope with it." Fingers crossed, everyone. Guess we're ordering Starz now.